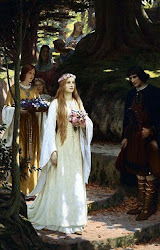 Welcome to a blog about weddings and history. I am writing it as I plan my own medieval wedding and here you will find inspirations, do-it-yourself stuff and links from the period 1050-1536 A.D. Enjoy! The wedding day was one of the rare occasions when a woman could let down her hair. 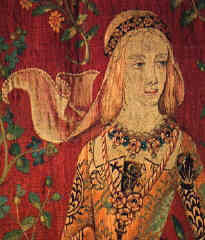 Often flowers would be braided into it or she wore a wreath of flowers to symbolise fertility and beauty. 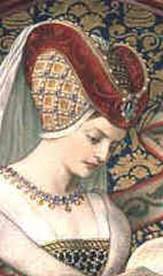 The bridal crown was an expensive alternative and after the wedding the bride's hair would be covered with a hat or veil. 1. 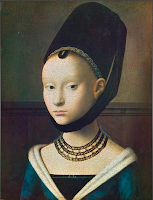 The larger the forehead the more beautiful you were considered to be. 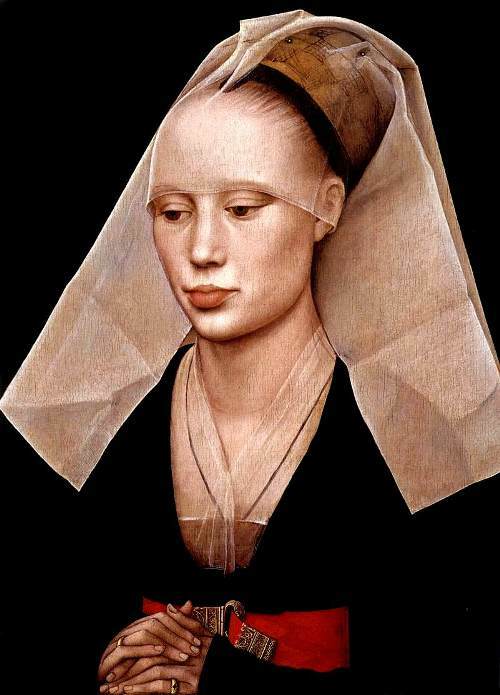 Women plucked their hair and eyebrows to get the perfect look, that's why sometimes the woman look balled in the painting of the time. You can do with just combing your front hair back. 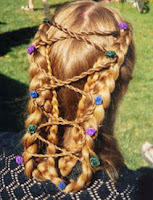 2. braiding your hair will also add to the medieval vibe. 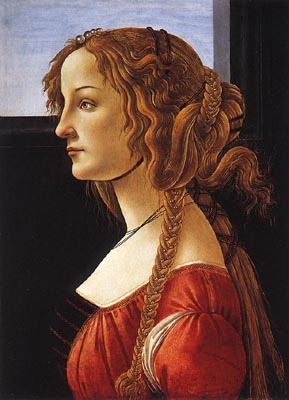 There are some very artistic examples of braiding in the medieval times. 3. A headband of fabric or metal will also make a nice contribution. 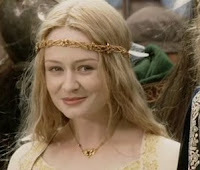 If you want some inspiration, the character Eowyn from the Lord of the Rings has some beautiful ones. 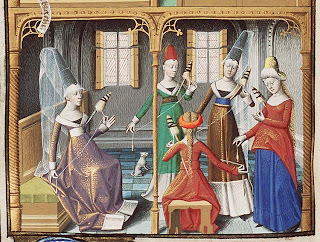 Hats and veils were very diverse in the medieval and you can really make some crazy types. 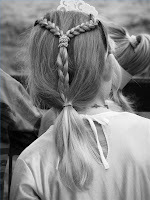 So that was a lot of pictures with a lot of thoughts on how to do your hair on the big day. Personally I am probably going to go with the very natural loose hair and a golden band over my forehead. A golden band, preferably of gold with jewels if you are noble, is a good idea for a bride. And after the marriage you of course put on your white linen veil immediately, to show your new status as a married woman. The women looked "balled?" Don't you mean "bald?" I am a nature-loving and warm-hearted woman with great love and consern for others. 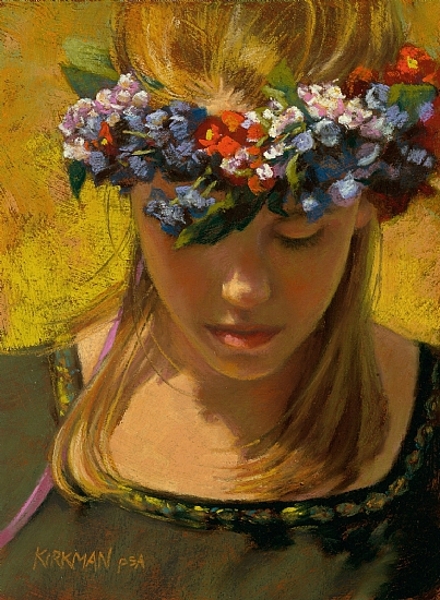 I enjoy learning and I am always curious about all that I don't know about: cultures, stories, music and art. Could you imagine having a history wedding?